1) Look for waterproof or water-resistant formulas, depending on your project. Many of the leather projects we work on require some level of resistance to moisture. Think about the environment in which your project will be used and choose your adhesive selection accordingly. For any items that will need to withstand rugged use outdoors, look for waterproof formulas to deliver maximum durability and longevity. 2) Consider whether you need a temporary or permanent bond. Sometimes we just need a temporary bond to hold leather pieces in place until sewing is complete and choosing lightweight spray glue will suffice. Other times, we want a permanent bond that will last the life of the product. Read the label to ensure you’re purchasing the right level of hold. 3) Choose a formula that achieves the desired hold in one coat. 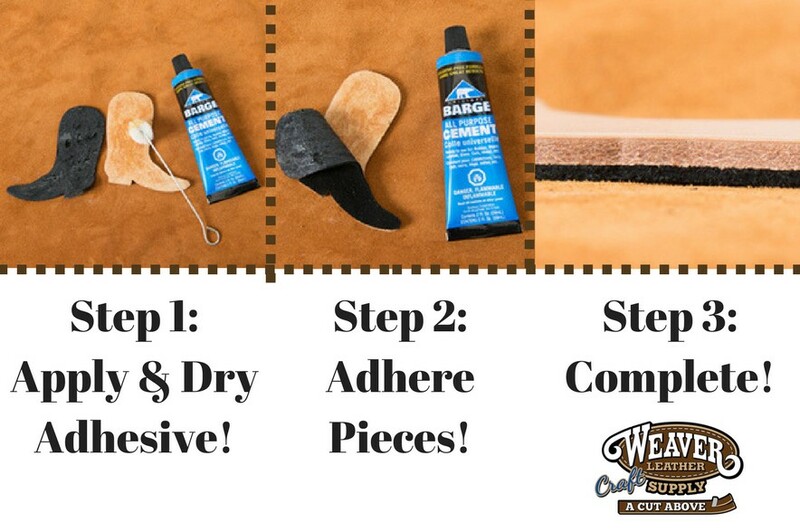 When working with leather, you want an adhesive that gives you fast, effective results. This will help reduce the chance of the leather shifting and making your job more difficult. Some formulas can be separated with cement thinner, like our Barge All Purpose Cement, but others will be almost impossible to remove, so select accordingly! Keeping these tips in mind will help you select just the right adhesive for your projects. It is often the culmination of small details that go into your project that determine a successful end result.